Sam is a Bristol based independent illustrator and Paper Artist. She currently lives in the rural countryside of the Mendip Hills, just south of Bristol UK. As someone who enjoys observing the world around her and taking in its beautiful and often comical charm, the stunning scenery and wildlife provides the perfect setting for Sam to create her playful, magical artwork. 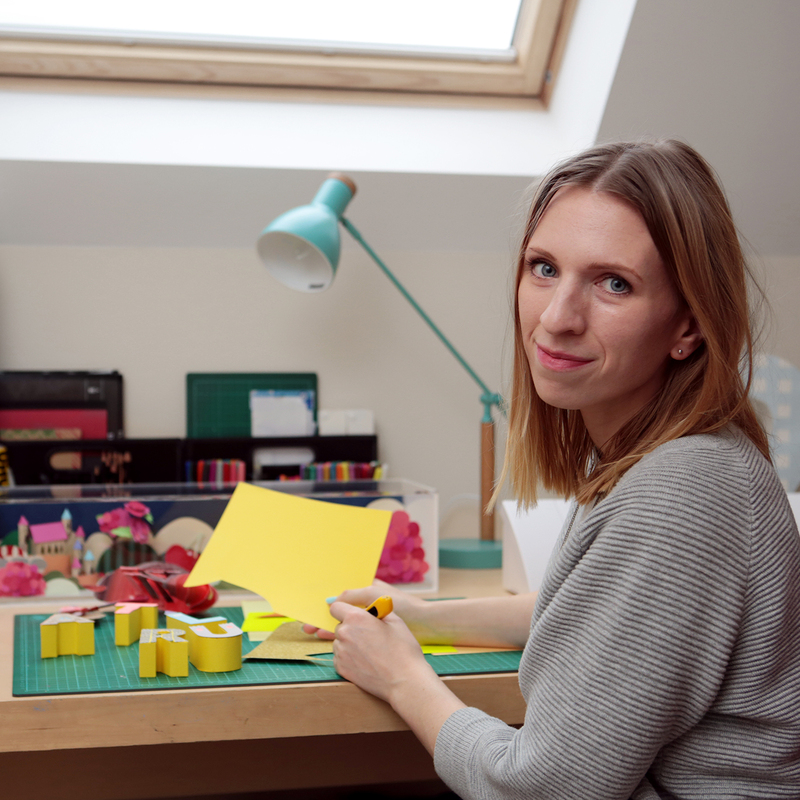 Sam directs, designs, cuts and hand crafts all of her creations from a range of fine quality G.F Smith papers and has skilled apprentices on hand who are able to get stuck in on larger scale projects. Sam regularly collaborates with talented designers, photographers, videographers and production companies to produce eye-catching, unforgettable work. Her paper sculptures are used both commercially and artistically, for a variety of different purposes ranging from advertising campaigns, set design, packaging and window displays predominantly in the events, travel + tourism, beauty and food + drink sectors. She has produced work for a range of clients, including Jetstar, Kiehl’s, Wall Street Journal, The City of Strasbourg, Goldsmiths University of London, Wimbledon Tennis, Mullen Lowe Group, Nokia and Visit Bristol. Sam’s work was beautiful and precise, with amazing attention to detail and absolute dedication to getting every element perfect! We are so happy with the results and would highly recommend Sam to anyone looking for amazing and eye catching paper sculptures – she is a master! I don’t need to tell you how good Sam’s work is or how it will give your campaign a brilliant look and feel – just click on her portfolio – it’s amazing! She’s an absolute pleasure to work with, taking onboard fresh challenges in her stride and with a totally positive can-do approach. Everyone at Creative Forager and Goldsmiths University was bowled over with her work on the pop-up book. Sam is an extraordinary illustrator, we’ve worked with her on several projects on creating illustrations for websites, brochures and can highly recommend her. Sam worked closely with our creative team to ensure we got what was needed and it was right for the client showing her versatility. Sam is an absolute pleasure to work with and a breath of fresh air adding real value to our creative. Sam created an amazing paper pop-up plate of food for a feature in Jetstar Magazine Australia. We were amazed with the result and thought it beautifully illustrated the story on pop-up restaurants and one-off food events. Sam was a joy to work with, very professional, stuck to deadlines and was great with communication. I look forward to working with Sam again in the future. Sam’s a talented and hard working designer. She is able to work up eye catching creative concepts and deliver high quality results appropriate to the brief provided. Sam communicates very well with clients to ensure excellent rationale is provided to back up her stunning work. Sam’s workshop was excellent, precede by a lively talk about her work, she conducted a workshop and students managed to turn out some very accomplished pieces in just three hours. Above all, Sam engaged with the students, putting them entirely at their ease and overcoming any creative inhibitions.